The protective outlet shell of this outdoor extension cord shields your power connections from the elements. 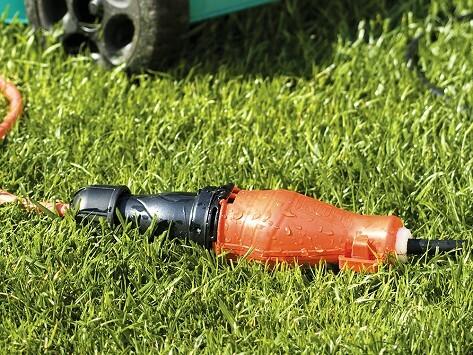 From landscaping tools to holiday lights, now you can ditch the homemade solutions (like a plastic bag and tape) for a safer way to secure that connection from sprinklers, hoses, rain, sleet, snow, and mud. Dimensions: 25 ft. Extension: 13.4" x 12.4" x 2.5"; 50 ft. Extension: 17.7" x 12.5" x 3.2"
Weight: 25 ft. Extension: 3.1 lbs. ; 50 ft. Extension: 5.5 lbs.